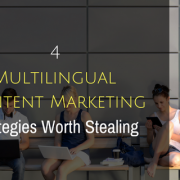 Experts agree: Multilingual content marketing is the future, and the future is now. But content marketing can be hard to get right, even in one language. Not just any content will do. You need content that attracts attention, provides useful information, builds relationships, and helps potential customers learn to trust you. Unbounce is a landing page and conversion marketing platform that helps marketers build, test and optimize landing pages. 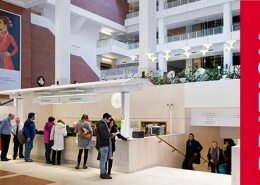 The company relies heavily on content marketing to grow their English-language business. They have a popular blog, a robust social media presence and a treasure trove of resources for marketers. In 2015, they began expanding into the German market. Naturally, there’s an excellent post on the Unbounce blog about the process they used. One key recommendation: Hire a local marketing ambassador. Unbounce’s Ben Harmanus uses his knowledge of the local area to select content to translate from English, position it appropriately, and build Unbounce’s German language community on social media. Literary translation is the translation of creative and dramatic prose and poetry into other languages. This includes the translation of literature from ancient languages and the translation of modern fiction so that it can reach a wider audience. 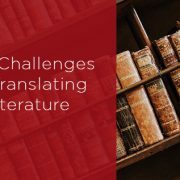 Why is literary translation important? Literary translation is of huge importance. It helps to shape our understanding of the world around us in many ways. Reading Homer and Sophocles as part of a classical education in school helps to build an understanding of history, politics, philosophy and so much more. Meanwhile, reading contemporary translations provides fascinating insights into life in other cultures and other countries. In a fast-paced world so rife with misunderstanding and confusion, such efforts to share knowledge and experiences across cultural boundaries should be applauded. An entire history of literary translation is far too big for the scope of a single article. Indeed, The Oxford History of Literary Translation in English runs to five whole volumes, such is the depth and complexity of the subject. Suffice to say that literary translation has been taking place for thousands of years. Have you ever wondered why some letters in languages like German have those funny dots above them? Do they have a purpose? 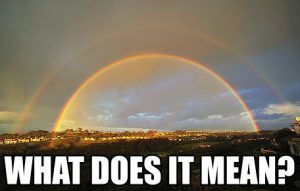 And if so, what is it? Fear not, we’re here to help! Those little dots are called umlauts. Here’s a brief history to explain what they are, why they exist and what they mean. 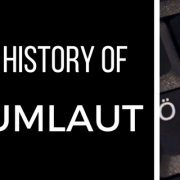 In linguistics, an umlaut is “a sound change in which a vowel is pronounced more like a following vowel or semivowel.” Languages change over time. And since people are inherently lazy, these changes are often motivated by a desire to reduce the amount of effort needed to create a given sound. Hence, the umlaut. In German, the umlaut punctuation mark is used to indicate this sound shift. In medieval times, scribes indicated umlauted vowels by placing a small letter “e” directly above them. Over time, the “e” evolved into 2 bars, and then finally into two dots. German orthography includes ä, ö, ü as “special characters.” They aren’t considered part of the alphabet in their own right. But they’re still important. 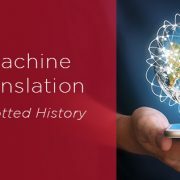 The concept of machine translation has existed for centuries, but it was not until the early 1950s that it began to become a reality. Since then, machine translation has advanced hugely, though it still cannot yet compete with the skill and finesse that a human mind can apply to translating a document. In 1949, Warren Weaver of the Rockefeller Foundation put together a set of proposals on how to turn the idea of machine translation into reality. He blended information theory, code breaking lessons learned during the Second World War and the principles of natural language to pave the way for machines to translate one language to another. By the end of this century, linguists expect more than half of the languages in the world to die. It’s a bleak statistic, especially given how deeply language and cultural identity are bound together. But linguists, language activists and the people who speak endangered languages are fighting back. Want to save an endangered language? There might be an app for that! 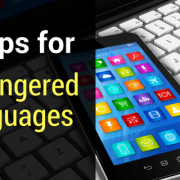 There are apps to teach endangered languages to people who don’t speak them. Alternately, some apps make it easy to record native speakers of any endangered language, translate what they’re saying, and share it with linguists and language preservationists. It teaches the language, with a dictionary, a phrasebook and a “Wordmaker” that lets users experiment with phrases and sentences to see how different elements of Iwaidga grammar and syntax work together. It allows anyone working with Iwaidja speakers to input new words, phrases, and translations. Your English teacher may not have approved of it. And the older generations may start muttering about kids and lawns when they hear it. But slang helps keep languages interesting and alive. And many of the words and expressions we use today started out as slang. Often playful and colorful, slang is like a laboratory for language. Slang is everywhere, and most of it defies direct translation. 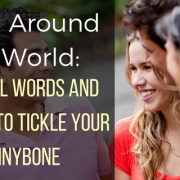 Want to learn more about slang around the world? We’ve collected some of the fun niest and most interesting slang words and phrases in different languages. 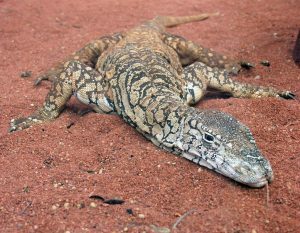 Funny Australian Slang: Who gave that lizard a beer? Flat out like a lizard drinking. Surprisingly, this has nothing to do with drunk reptiles. Instead, it means you’re extremely busy. Translation: Long in the tooth. 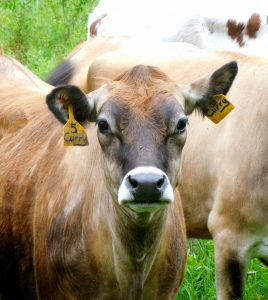 Who are you calling a Spanish cow? Parler comme une vache espagnole. Translation: To talk like a Spanish cow. Arrête de te la péter. We place a vast amount of trust in the veracity of the information provided on food packaging. For those with food allergies, their lives can depend on the information that the packaging provides. For those who are dieting (whether for personal or medical reasons), ingredients and calorific values both have to be spot on. Then there are the cooking instructions – a mistake in the details of how to cook products such as pork or fish could have fatal consequences. That’s why there are so many rules and regulations around food labelling. 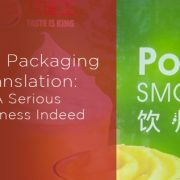 It’s also why translating food packaging is such a serious business. Food labelling requirements differ from country to country. 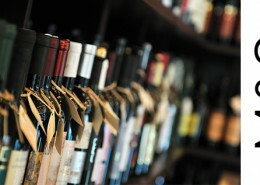 In the UK, the law requires that food and drink products must have labels that are permanent, easy to read and understand, easily visible and not misleading. The label has to include the name of the food, a ‘best before’ or ‘use by’ date, quantity information and any necessary warnings. The “alt-right” was a notable force in last year’s election for US president. The loosely organized collective of right-wing trolls spread memes and “fake news,” helping to influence public opinion against Hillary Clinton and in favor of Donald Trump. 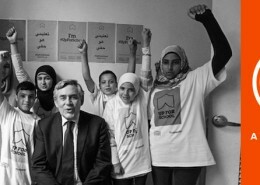 They certainly weren’t the only factor, but they had an impact. But when they tried to duplicate their success in the French election, they failed. 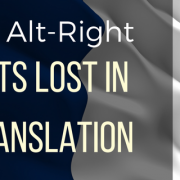 And while their failure inspired sighs of relief from people around the world, it’s also an informative case study on the importance of localization. Here are 3 lessons we can learn from it. Before selling your product in a new territory, you need to research the market. How will your product fit in? What are your target customers like? 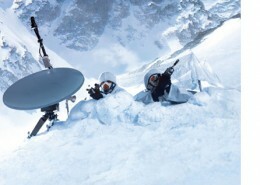 How do they get their information? That rule holds even if your “product” is a loathsome ideology. Within days, the online thread — and similar discussions across the internet — was flooded with hundreds of users in the United States offering to help the digital campaign. 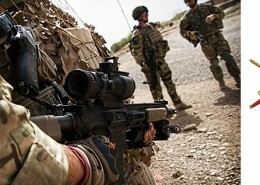 But the American tactics have not translated overseas. The analysis . . . showed that more than one-third of posts linked to certain political hashtags originated from the United States, although few went viral in France. So, despite the global nature of the Internet, US-based social media chatter about the French election tended to stay in the United States. International translation services are, without a doubt, invaluable when it comes to helping companies market their products and services overseas. However, translating business materials that are intended for presentation to foreign audiences involves a much more complex process than simply converting words from one language to another. 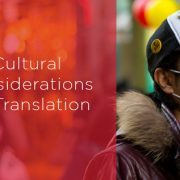 A significant amount of time should be dedicated to elements of localization if the translation is to be truly successful. By doing so, companies can protect themselves against their message inadvertently causing either hilarity or offence overseas. 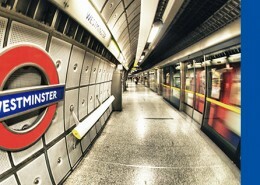 Localization complements professional translation. It can be summed up as a form of modification that draws knowledge of local culture and customs and applies that to translated copy, so as to ensure it is appropriate for a new audience. If you are a manufacturer of dietary supplements, functional drinks, or any other food with added health benefits, the whole world is now your potential marketplace. Over the last few years, health-conscious consumers have fallen out of love with the idea of “dieting” and started to embrace an all over “healthy lifestyle”. The trend is set, and it’s already more than a fad: people want “real”, unprocessed food, possibly organic and sustainably farmed and they’re not afraid to take supplements to achieve optimum nutritional balance. As a result, functional and fortified foods, dietary supplements and nutraceuticals are growing in popularity, and technology makes it easier than ever to export abroad. Preparing your food supplement product packaging for a foreign market goes beyond translation. It’s also about making it fully compliant with local food regulations. The first important distinction is whether the country you’re exporting to has a pre-market evaluation or not. In the US, for example, no approval is required to market food supplements. 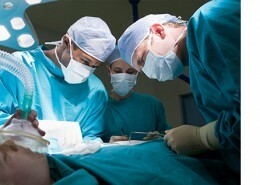 Manufacturers and distributors are responsible for their efficacy and safety. Canada, on the other hand, has a quite stringent pre-market approval process. 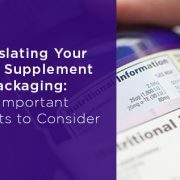 Whatever the case, translating your food supplement package correctly is something you’ll want to get right first time. Product recalls can happen anytime and for a variety of reasons: lack of ingredient compliance, misleading claims or incorrectly displayed labels.